Workshop: Austro-Hungarian Embroidery gone Electronic « Adafruit Industries – Makers, hackers, artists, designers and engineers! Participants will experience first hand the making of Exquisite Electronics and produce their very own piece of hand-embroidered electronic Haute Couture. 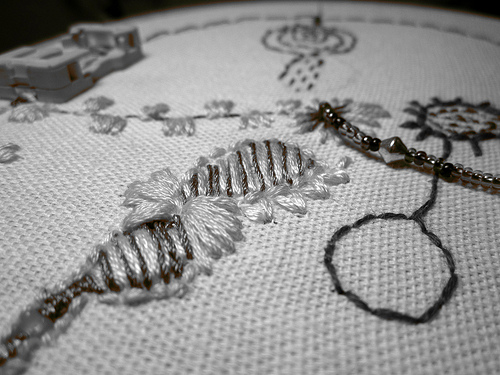 The workshop will cover traditional embroidery techniques, using contemporary conductive materials, such as conductive threads, fibers, fabrics and yarns, to create highly decorative circuitry with unique functionality. The workshop not only introduces a range of e-textile techniques, but also draws attention to issues surrounding electronic textiles, such as e-waste, diminishing resources, the industrialization of craftsmanship and the impacts of globalization. By raising these topics we hope to start a discussion among the makers of electronic textiles in order to project a more futuristic future vision of skilled craftsmanship as it may be applied to electronics. The workshop will last 2 or more days and will be open to the general public. A maximum of 15 participants will be able to attend the workshop, and while previous experience working with either textiles or electronics is encouraged, the workshop is open to everybody eager to learn and master a new set of skills.